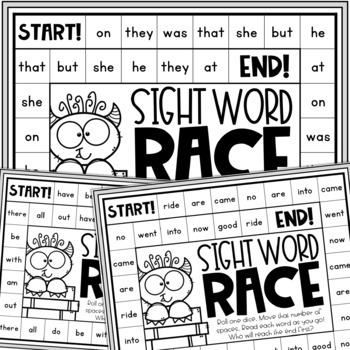 Do you have students who need practice with basic sight words? I love having quick, NO PREP centers that my students look forward to doing each day. In this set of Dolch Sight Word Printables, your students can practice Primer Dolch words in engaging ways without spending hours prepping centers. I use these in my small groups with an assistant or myself as well. Connect Four: This center includes thirteen pages to use to practice four sight words at a time. I also grouped these four words based on frequency, so you'll see short one to two letter words grouped together with larger, more challenging words on later pages. 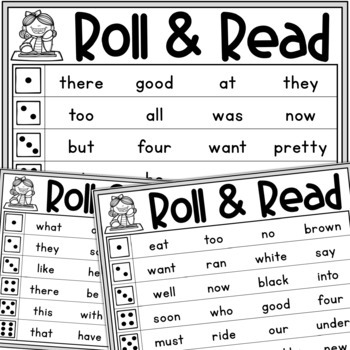 Roll & Read: In this center, you'll find four pages with an twenty-four words to review on each page. These words are not grouped based on frequency, but rather a mix of all Primer words to help students review all words. Bump! : Bump is a fun game that my students beg to play each day. Using game pieces and dice, students will practice six words at a time. Sight Word Races: Who can race to the end first? Using dice, students will roll and move their game pieces around the board, reading words as they go. These game boards have eight words on the board, also grouped based on frequency. Sight Word Bingo: Who doesn't love to play Bingo? We play every day to review ALL words. You can choose between a 3x3 or 5x5 grid to fit your small group.